I've been "camping" in luxury's lap down by Caballo Lake, New Mexico. This is far from Spud-tenting; don't hate me because I'm decadent. My wifi device is behaving badly, and I'm reporting from the McDonald's in Truth or Consequences. Seclusion is great, and all, but Germany vs. Brazil is not a court case. Annie said "everyone has to do foot shots.". I grudgingly comply. This is my first-ever broken bone, and I don't have coping skills. This cast copes on my behalf. I've also had good care that walks (with two good legs) the thin line between coddling and neglect. My caretaker quacks me up when I flap too near self-pity. I'll be solo soon, and I need to stay around Las Cruces until my follow-up orthopedic appointment on the 15th. After that, I think I'll head someplace cooler. I planned to go to Florida to see my mom, but if I need to return in a month for the leg unveiling, that's a long trip for two weeks. what's invisible and smells like carrots ? Mother rabbit hops out of the burrow and tastes a turnip. She says to Father rabbit, "That turnip tastes pithy." Father rabbit tries it and says, "You're right, it does taste pithy." Baby rabbit hops out of the burrow at that point and says, "That's because I just pithed on it." Yeah, me too. So, anyway, I am SO SORRY about your broken foot. EEK! OW! I still intend to meet with you in Pie Town so we can eat many incredible pies. I hope I am still alive when that happens. 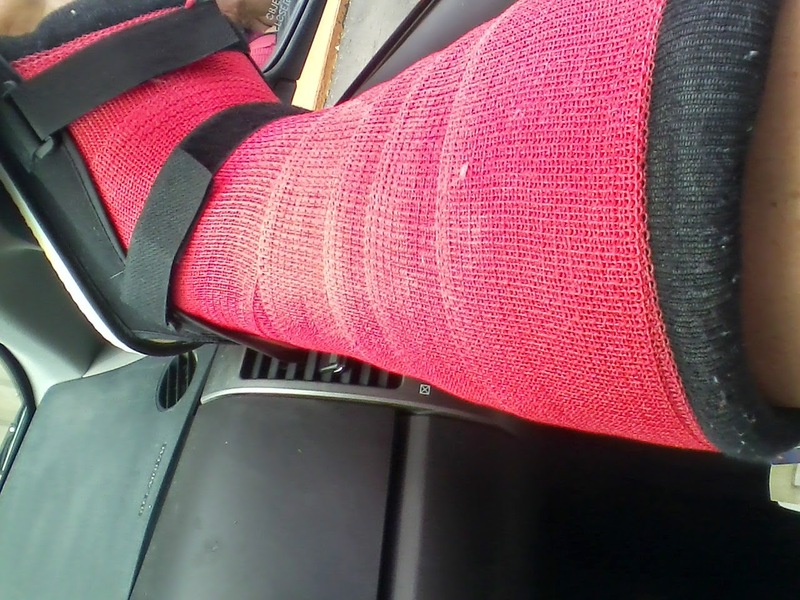 man...that cast reminds me of the 2 I had which I grew to hate...I hope its easier on the foot/leg Mine itched, got tighter every night when my arms would swell up and then they began to stink!! I called an begged to have the last one removed 2 days early...even threatened to remove it myself..Really hope it goes easy for you you have my condolences! Glad to hear you're mobile. Those "walking casts" are miraculous things; had one put on 4 days after I broke my leg & couldn't BELIEVE I could actually put weight & walk on that leg. One of life's miracles. So glad, because the crutches sucked. Sorry, I got nothin' so far as jokes go. I can't remember one for as long as it takes me to go back to my own campsite. This is my all-time favorite joke. It even has a sequel but I'll save that for another time. He did fine on the job for months but then one day he went to ring the bell, tripped, bounced off the bell and fell to the sidewalk below. Two guys were walking past. OK, so here's my very first post on your blog, in honor of your request for a joke. Did ya hear the one about the Buddhist who went up to the hot dog vendor and said, "Make me one with everything." Then the Buddhist pays for his hotdog with a $20. The vendor pockets it. The Buddhist says; "Hey, where's my change?" The vendor smiles mysteriously and says, "Change comes from within." What do you get if you put a duck in an area of geological activity? What kid of a doctor treats ducks? I think your cast is quite chic. Just hope it isn't a boot. You can drive with it? Now that's lucky. I have a stick shift and broke my left ankle. It was a LONG 2 months. I think you have already heard all my jokes. They are old and stupid. At what time does a duck wake up? At the quack of dawn. What do you call a cat that swallows a duck? A duck-filled-fatty-pus. That's enough don't you think?? I said to the Gym instructor "Can you teach me to do the splits?'' He said, ''How flexible are you?'' I said, ''I can't make Tuesdays. 20 years ago we had Johnny Cash, Bob Hope and Steve Jobs. Now we have no Cash, no Hope and no Jobs. Please don't let Kevin Bacon die! A rabbi a priest and a politician walk into a bar. The bartender says "Is this some kind of joke?" Sounds like you're getting the right amount of care giving. Hope you're taking lessons for when you have to do it yourself. Pep talks, not pity parties! Bad time to be without WiFi though, hopefully the cooler place will have it! Oh, you guys - I knew I could count on you! I'm literally LOLing. I'm still laughing at the bell ringer joke. So bad it's good! I have never remembered a single joke in my whole life so I'm of use in this situation. Get better.